As I know from other practical books of Thorsson that I read, his system is not for me. Pretty soon after starting the book, I started to quickly read through the exercises and see if the more theoretical parts would be of more interest. Here and there they are, but also in these parts, Thorsson is often not my kind of thinker. Obviously the Rune-Gild is not for me, nor is Thorsson as an esoteric author. I guess I better stick to his more scholarly works. 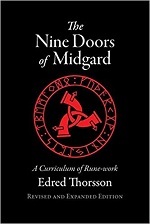 That said, if you are curious what the Rune-Gild is all about or are you in general interested in an esoteric take on the Norse way, just get yourself a copy of this book and see what you think of it. Should you enjoy the book, there are references to many, many other books to study next. If Thorsson isn’t your kind of esoteric thinker, who is? Which system do you subscribe to? None from ‘Alpha to Omega’. I prefer to form my own ‘system’ which will never be complete I’m afraid.